^ Merriam-Webster dictionary online Archived 2013-02-02 at the Wayback Machine accessed 21 March 2013. ^ Moore, John Weeks (1880) . "Aria di bravura" . Complete Encyclopaedia of Music. New York: C. H. Ditson & Company. ^ The Oxford Companion to Music, "Concert aria"
^ "Birtwistle - Grimethorpe Aria for brass ensemble - Universal Edition". Universal Edition. Archived from the original on 28 April 2018. Retrieved 28 April 2018. 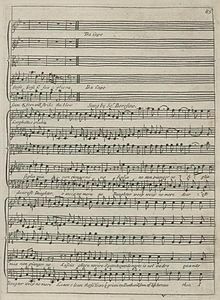 This page is based on the Wikipedia article Aria; it is used under the Creative Commons Attribution-ShareAlike 3.0 Unported License (CC-BY-SA). You may redistribute it, verbatim or modified, providing that you comply with the terms of the CC-BY-SA.